ASM Industries, the largest Portuguese producer of wind towers and offshore foundations, formalized last 30th May, a collaboration protocol with MWS-Group – Master Welding Solutions, consultant in several areas of engineering, to conduct training in the field of welding for undifferentiated young people. The two companies, based in Sever do Vouga, have created an innovative training course integrated in ASM Skills Program, with a more digital approach through the use of enhanced virtual reality simulators, to attract more young people to the professional specialization and later admission in the area of ​​metalworking industry. “To the know-how of ASM Industries professionals in metalworking production we’ve brought together the MWS-Group’s technological expertise in welding, and we invested in a joint training plan, integrated in ASM Skills Program, with a digital dimension to qualify undifferentiated and young people, who would like to work in this industry, “says Adelino Costa Matos, CEO of ASM Industries. “In the Portuguese industry, especially in the interior, there is still a lack of qualified and experienced professionals, and consequently increases the difficulty in recruiting,” says the CEO. In November 2017, ASM created the ASM Skills Program, an in-house training center, to address the lack of skilled labour, with courses in the areas of Oxycutting, Calendering, Welding and Metalwork, essential to the activity of ASM Industries. “The new training we now provide with MWS, is a new and important training path for the ASM Skills Program, where we want to affirm our experience, quality and excellence, and thus recruit more young people into the industry,” says Adelino Costa Matos. As an important complement, ASM Industries guarantees employment for the candidates trained in functions, with salaries adjusted to the results of each participant and supports 75% of the cost of the course. 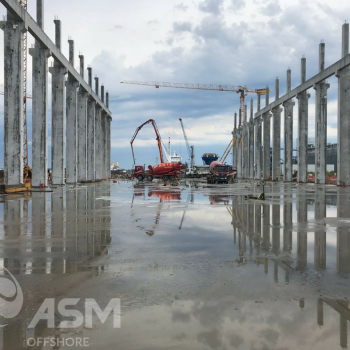 These employment opportunities are available for the ASM Industries operating unit at Sever do Vouga and for the company’s future facilities at the new operational unit at Aveiro Port, scheduled to open in March 2019. The training will begin in July and will be given on a first phase in MWS, and secondly, in ASM Energia, in groups of four (minimum) to twelve people (maximum) depending on the applications, both theoretical and practical: 22 hours in theoretical training room, 138 hours of simulated practice, bench practice at the welding school and at workshop. The course relies on the expertise of the MWS technicians and the ASM Welding Engineers team. Both with proven experience and didactic skills, as well as production supervisors, experienced professionals who have been working on the workshop for more than 30 years. Those interested in the new training promoted by ASM Industries and MWS-Group can send their applications to the e-mail: skillsprogram@asm-industries.com. ASM Industries is a sub-holding company of A. Silva Matos Group, an exclusively family business structure, and is constituted by the companies: ASM Energia (A. Silva Matos Energia SA), ASM Offshore (ASMI II Offshore Industries SA) and ASM Marine (Odisseia Plural SA). Currently the ASM Group is constituted by more than 20 companies, located in several countries, totaling around 450 employees and earning about 50 million euros. ASM Industries is committed to technological innovation for the production of wind towers and structures for offshore use. MWS-Group is a company incubated at VougaPark – Parque Tecnológico e de Inovação do Vouga and it is specialized in technical solutions in the most varied activities related to the metalwork industry – Engineering, Consulting, Inspection and Training. With three years of existence, MWS has affirmed itself in the National and International market, due to its strong commitment to rigor, innovation and the latest technologies for the sector in which it operates. MWS has advanced technological resources and specialized personnel in welding, piping and metalworking, guaranteeing the efficient and continuous transfer of knowledge to its graduates.